Because of its popularity, this file now is available only from the high performance LoDN file service. LoDN uses Java WebStart. If you don't have it yet, you may need to install Sun's Java2 JRE (Java Runtime Environment). 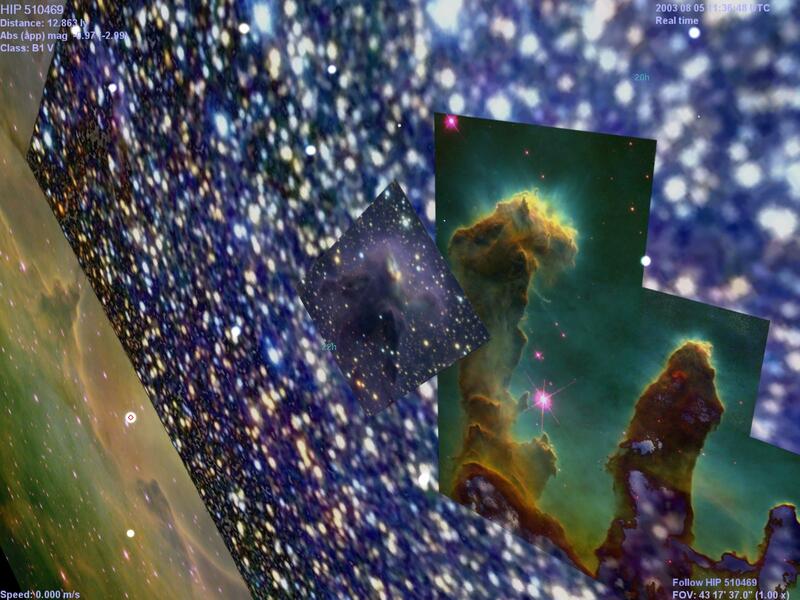 These add-ons for Celestia v1.3.0 (or later) display a montage of six images of the Eagle Nebula and its associated galactic cluster, M16. They also include an STC file defining 74 of the stars in the cluster. (Some of these star definitions specify star names, which requires Celestia v1.3.1pre3 or later.) 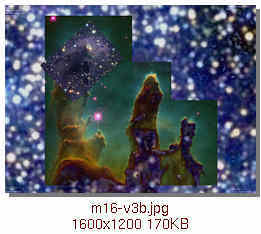 While m16-v2 contains transparent images, the images included in m16-v3 are opaque. The easiest way to install these add-ons is just to expand the .ZIP archive into Celestia's extras directory. Zip will automatically create the subdirectory m16-v2 or m16-v3 and its contents. Errors were reduced from about 1 second of arc in Right Ascension (1/15 second of time) to better than 1/10 second of arc (1/150 second of time). The improved coordinates were obtained by using a more accurate routine to precess from B1950 to J2000, the Starlink subroutine fk425.f. See http://star-www.rl.ac.uk/. The thumbnails below link to larger images. 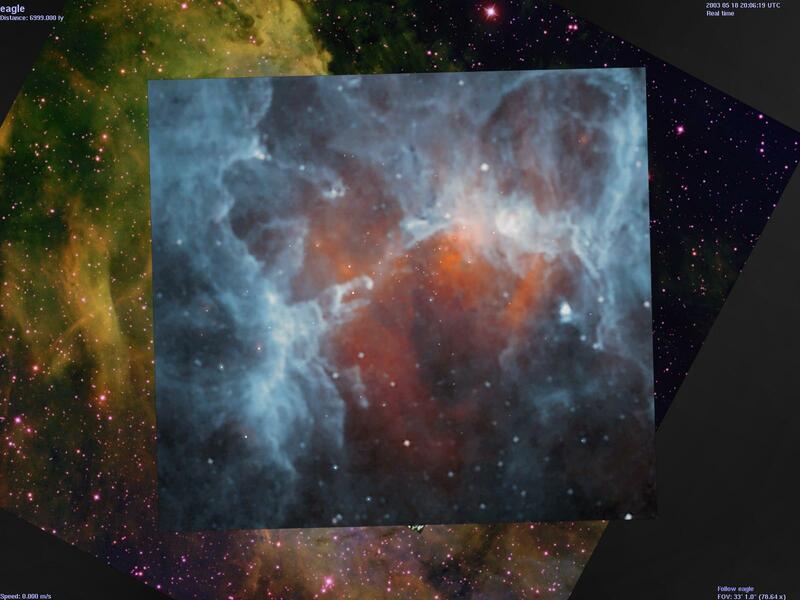 eagle.dds (1Kx1K) A picture showing the cold nebulosities (-100 degrees Centigrade) that fill the Nebular region, from ESA's ISO. These images are all DDS texture files in order to provide adequate performance when loading the textures and to minimize the amount of graphics memory needed. 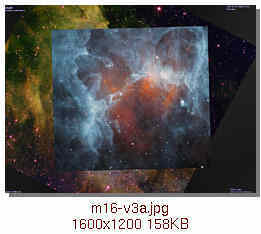 In m16-v2, all but the backdrop, 04086.dds, incorporate alpha channels which let you see though them to the images behind. 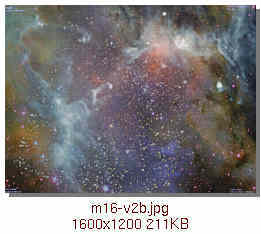 In m16-v3, the alpha channels of all of the images eliminate only the black borders. Borders were added around the smaller images instead of scaling them up to a size needed by Celestia. This should limit the damage done to the resolution to that inflicted by your graphics hardware. 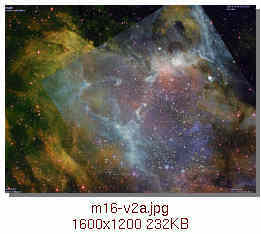 However, two of the images, "04086" and "phot", were scaled down from much larger versions available on the Web. Hopefully soon Celestia will allow selecting among Nebula textures as it does among alternate planetary surface textures. In the meantime, you can edit m16-v2.dsc and comment out the Mesh declarations of those "billboards" you'd like to ignore. This add-on has several limitations which may be corrected in a future version. 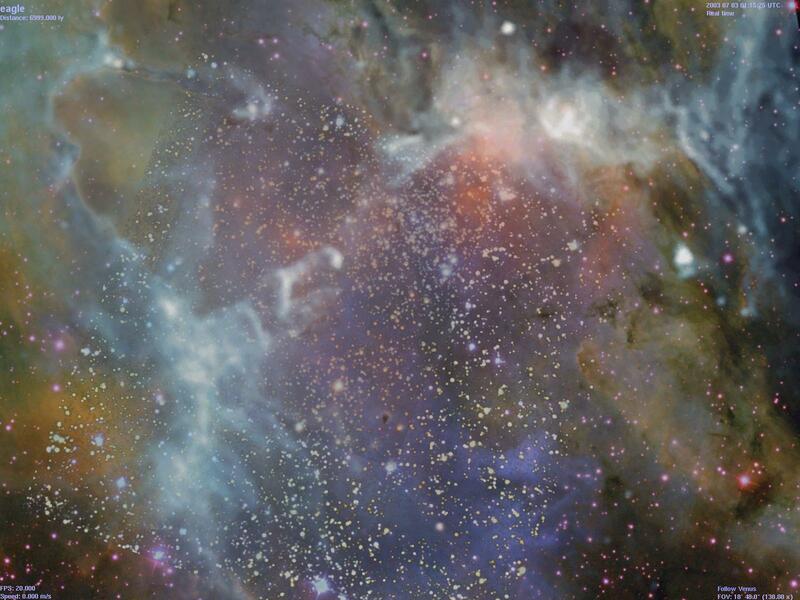 Most prominent is that the stars in the cluster are all shown at the same nominal distance of 7000 light years. Determining their relative distances from their apparent magnitudes, UBV colors and luminosity types will take more effort than I can invest right now. 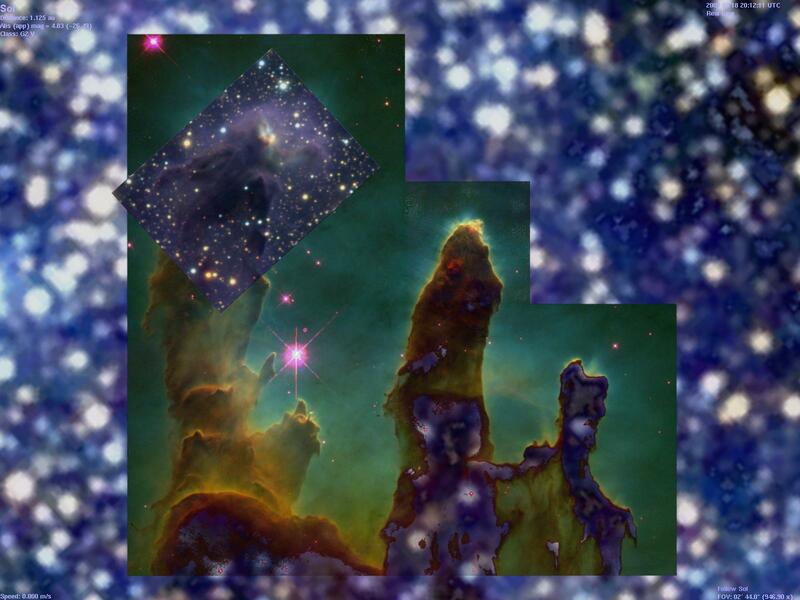 To me, many of the star images look like dirt smudges on glass. 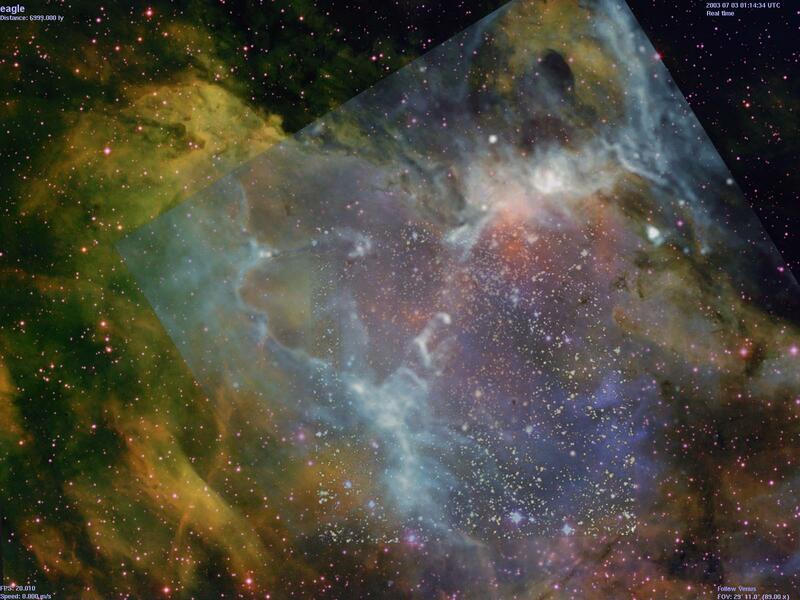 The stars in the infra-red mosaics from 2MASS and ESO are saturated, so that they have the same brightness over a relatively large area. (Presumably this is a side-effect of converting from 16bit FITS images to 8bits/channel color images.) As a result, the transparency masks, which are just grey-scale versions of the original images, can't give them translucent edges. Grant Hutchison provided a spreadsheet calculator which greatly improved the alignment of the images. The original images were created by the research groups credited below. 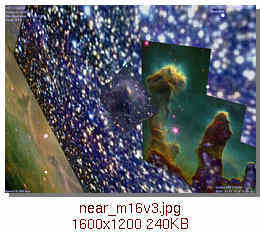 NOAO false color image of the Eagle Nebula used with implicit permission: educational outreach by an amateur astronmer. This Web page is maintained by Selden Ball at Wilson Lab. Alternatively, you can post a message (anonymously or otherwise) on Celestia's Web Forum or use its Private Message page. If you don't tell me that something's missing, unclear or wrong, I can't improve it. The author disclaims all liability and endorsement. For details, please read the full text of his disclaimer.